U.S. Marine reservist Sgt. 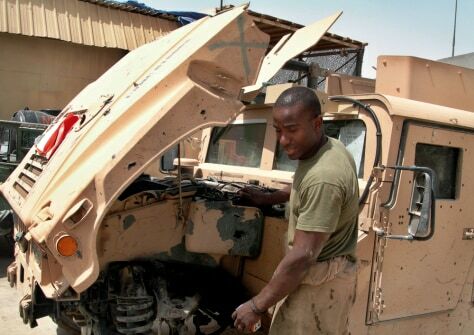 Recordo Demetrius of Garden City, N.Y., repairs a Humvee damaged by a roadside bomb in Fallujah, west of Baghdad, Iraq, in this June 10 photo. With the war in Iraq still raging and the full-time military stretched thin, the Pentagon is counting on volunteers to fill the gap.